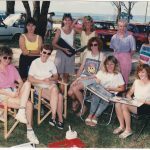 Ford RS Owners Club (Australia) – Not just for Owners! 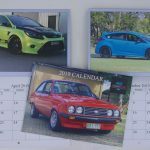 The Ford RS Owners Club of Australia consists of many extremely friendly active enthusiast members located all around Australia who have an accumulated wealth of first hand knowledge on all Ford RS vehicles. The members openly strive to provide the correct support and technical information where needed so as to assist owners to preserve and maintain the heritage of these unique vehicles. The Club has a strong social appeal which extends all over the world. Interested in a run to Wiseman’s Ferry Inn for a pub lunch Sunday 3rd March? Sydney members meet us at Maccas McGrath’s Hill around 10:30am for an 11pm start. 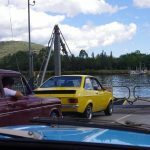 We will drive to the Inn and meet up with the Hunter British Ford Group who are heading south from Morisset. If you are keen and want a seat booked at the Inn for lunch please let Stephen Roser know by Tuesday 26th Feb.
Because of the traffic around the area at Harry’s Liverpool on a Saturday morning, especially this time of year, the start point of the rally tomorrow has been moved to McDonalds Bonnyrigg – cnr Elizabeth Drive & Smithfield Road. All other details stay the same – first car away at 10:00am, rally finishing in a suite at Sydney Motorsport Park for lunch. 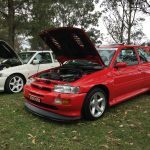 Sydney Christmas Rally and lunch is scheduled for Saturday 8th December. Start from Harry’s Cafe Liverpool. First car away at 10:00am. Ends at Sydney Motorsport Park. We’ve secured “The Champions Room” which is a Corporate suite above the pits. Lunch is available on site. Run and won. Gallery link. The rally will start from McDonalds McGraths Hill at 9:30 and end at the Australiana Village at Wilberforce where the Concourse and Display will be held. 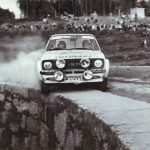 Our celebrity guest this year is a well know competitor over many years, driving a variety of fast Fords from both the Group C and Group A Touring Car days. Hope to see as many as can make it ! AGM will run this Sunday 21st October at 9 Sadlier Ave, Milperra and will start with a BBQ at 12:00. All welcome. The club 2019 Wall Calendar is now in stock. $20 plus postage. It contains the usual mix of RS cars owned by members from most states of Australia. For the RSOC members in Sydney don’t forget that our next monthly ‘pie night’ is on Wednesday 19th September at Harry’s Cafe de Wheels in Liverpool. See you there around 7:30pm. Due to circumstances beyond our control our Annual Concourse & Display Day and Dr Detail Rally scheduled for 9 September has been postponed a couple of weeks. A new date will be announced for October shortly.